OK, business travelers. This is one of the best convention center/airport runs in the world. 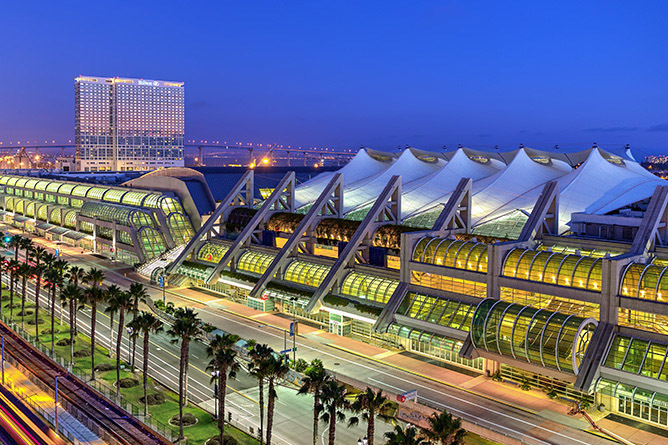 The San Diego Airport is only a couple of miles from the Convention Center, which borders on downtown, the baseball stadium, and the Gaslight area (tons of shops & restaurants). And it’s all on the waterfront, affording wonderful running opportunities. This run starts at the Convention Center, exploring the Embarcadero North & South, Seaport Village, Seaport Village, and waterfront park. It’s an off-road path with great views of the water and the city for most of the run.